Saint Paul Clergy Alumni Reverend Alan Gager, Reverend Jeff Slater, Rev. Jeff Goetzinger, and Reverend Mic McGuire (not pictured) came together in a collaborative effort to move the Hutchinson Area UMC Thrift store ministry to downtown Hutchinson. The Fair Price Store had its grand reopening in it’s new location this spring. The Fair Price Store started off as a ministry in a local doctor’s office when he saw a need to help patients and others in the community who needed a helping hand. When he retired, the area United Methodist churches saw a need to continue to serve the community with the vital clothing ministry. In partnership with First Call for Help the store now helps to fill clothing vouchers and to provide household staples such as bedding and towels for those in need. The store provides a shopping experience for others with clothing in all sizes, at inexpensive prices. The ministry is made possible through the work of the laity in each of the churches in the Hutchinson area. Each church takes two months out of the year to staff the store, sort through donations, and to help customers with their shopping. The decision to move was not taken lightly. After months of praying and searching for an affordable location a new landlord surfaced. The Wray family are members of South Hutchinson UMC and have been part of the thrift store ministry for several years. They offered a price and location downtown that fulfilled the vision of the store’s mission. 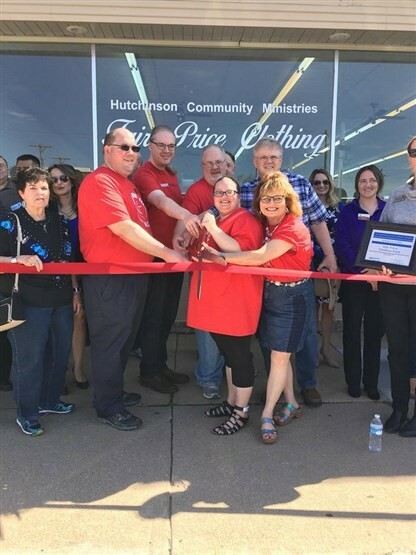 Clergy members jointly agreed that the store become a member of the Downtown Hutchinson Chamber of Commerce and even took part in a ribbon cutting ceremony. Since that time the store has been involved in multiple downtown events. The largest event took place during a Third Thursday music and art walk. Pastors from Trinity, Faith, South Hutchinson,10th Avenue, Fairview and Mitchell Chapel United Methodist Churches worked together to coordinate music and food. Together they went through 400 hot dogs, chips, cookies and lemonade. “I thought it was great to see all the churches come together to support this hugely successful event. We look forward to continuing to serve our community,” said Rev. Jeff Goetzinger, pastor of Fairview and Mitchell Chapel United Methodist Churches.